Nikola Tesla was born in Croatia (then part of Austria-Hungary) on July 9, 1856, and died January 7, 1943. He was the electrical engineer who invented the AC (alternating current) induction motor, which made the universal transmission and distribution of electricity possible. 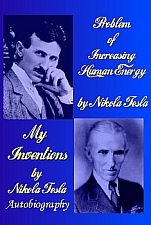 Tesla began his studies in physics and mathematics at Graz Polytechnic, and then took philosophy at the University of Prague. He worked as an electrical engineer in Budapest, Hungary, and subsequently in France and Germany. In 1888 his discovery that a magnetic field could be made to rotate if two coils at right angles are supplied with AC current 90Á out of phase made possible the invention of the AC induction motor. The major advantage of this motor being its brush less operation, which many at the time believed impossible. Tesla moved to the United States in 1884, where he worked for Thomas Edison who quickly became a rival Edison being an advocate of the inferior DC power transmission system. During this time, Tesla was commissioned with the design of the AC generators installed at Niagara Falls. George Westinghouse purchased the patents to his induction motor, and made it the basis of the Westinghouse power system which still underlies the modern electrical power industry today. He also did notable research on high-voltage electricity and wireless communication; at one point creating an earthquake which shook the ground for several miles around his New York laboratory. He also devised a system which anticipated worldwide wireless communications, fax machines, radar, radio- guided missiles and aircraft. Nikola Tesla is the true unsung prophet of the electronic age; without whom our radio, auto ignition, telephone, alternating current power generation and transmission, radio and television would all have been impossible. Yet his life and times have vanished largely from public access. This autobiography is released to remedy this situation.